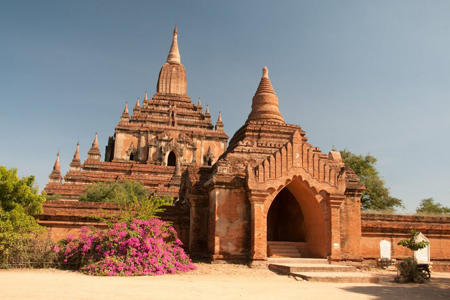 Bodawpaya had his temporary residence on an island in the Ayeyarwady river when he superintended for many years the building of the Mingun Pagoda on the west bank. 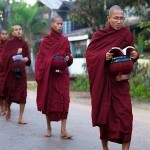 The pagoda, if completed, would have risen to a height of 500 feet, the largest one in the whole country. 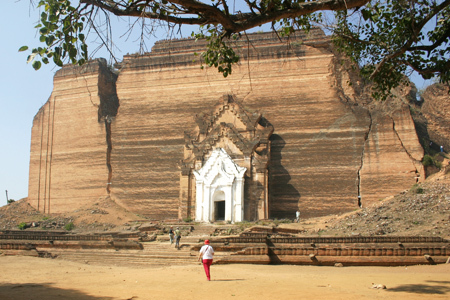 It was left unfinished when Bodawpaya died in 1819. As it stands it is the biggest brick pile in the world, the bottom terrace being a square of 450 feet and the basement on which the domical superstructure would rest rising to 162 feet. Each side of the huge cubical mass is hollowed out to accommodate a small shrine with a slightly projecting arch. The diminishing terraces above the obelisk have small square panels which were intended to receive glazed plaques of green, brown and yellow colours bearing in relief scenes from the five Buddhist Councils. The decoration of these plaques could not be effected when the construction was abandoned so they are now collected and preserved in an appropriate building nearby. This unfinished pagoda had suffered damage due to the devastating earthquake of 1838. About half a mile to the south is a small model the Pondawpaya 15 feet high designed as a working model for the huge edifice. 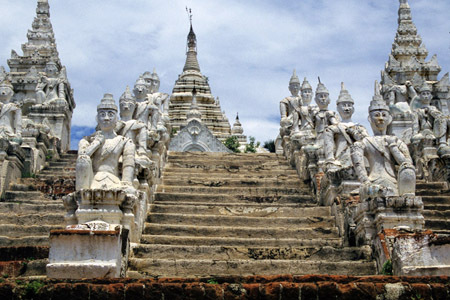 As appendages to the pagoda Bodawpaya had cast the largest bronze bell in Myanmar and also constructed a pair of colossal lions in brick and mortar. The bell is 12 feet high, has a diameter of 16 feet 3 inches at the lip and weighs 90 tons. No wonder it hangs as the largest ringing bell in the world. The statues of lions are now in a very dilapidated condition as they could not withstand several tremors of the earth since the erection. A few hundred feet to the north of the big pagoda is the Hsinbyume pagoda built by Bagyidaw in 1816 while he was yet a prince. It is in the form of the Sulamani pagoda resting on Mount Meru, the centre of the universe, according to the Buddhist idea of cosmography. It has a circular plan and seven concentric terraces parapetted with low walls of wavy pattern. Above the top terrace rises a cylindrical body which contains a vaulted sanctum. The superstructure assumes the common type of tapering pagoda. The sanctum is reached by three parallel flights of steps covered by an arcade of ornamental arches finished in fine stucco. This pagoda was built by the prince in commemoration of the death of his senior wife, Hsinbyume princess. Though it was damaged by earthquakes timely repairs were done and it is now in a good state of preservation. On the river bank is the Settawya pagoda which contains a vaulted chamber. 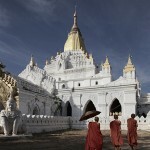 In it is placed a marble footprint of the Buddha brought over to Mingun by Bodawpaya when the relic chamber of the big pagoda was ceremoniously sealed. This temple was completed in 1811.